Whether you want to join other residents in the fitness center, spend the afternoon crafting, or cozy up with a good book in the library, each day is new and exciting at Abbotswood at Stonehenge. Our Wellness calendar is filled with a variety of programs to keep you as busy as you'd like to stay and help you maintain an active and healthy lifestyle. While there is always plenty to do on campus, we love to help our residents explore Raleigh. Each month we hold many different outings that range from sightseeing bus tours to picnics in the park, visits to museum exhibits, concerts, and everything in between! Your opportunities are only limited by how you choose to spend your time. As you participate in our award-winning “The Art of Living WellSM” programs, you know your choices are designed to help you maintain an active lifestyle doing things you love, doing activities that challenge you, learning new things, staying physically active, enjoying the company of friends and family, pushing beyond your boundaries, going out on the town, discovering new passions, and more. Join us for our Open House featuring our newly renovated one and two bedroom apartments and discover our beautiful, full-service community. Come meet our tenured and talented Chef, meet our exceptional team, and get a firsthand feel for the warm and friendly community lifestyle that Abbotswood at Stonehenge is all about. We will send you home with a specially prepared dinner meal so you can have the night off from cooking, which is one of the many reasons for joining our family here at Abbotswood at Stonehenge. 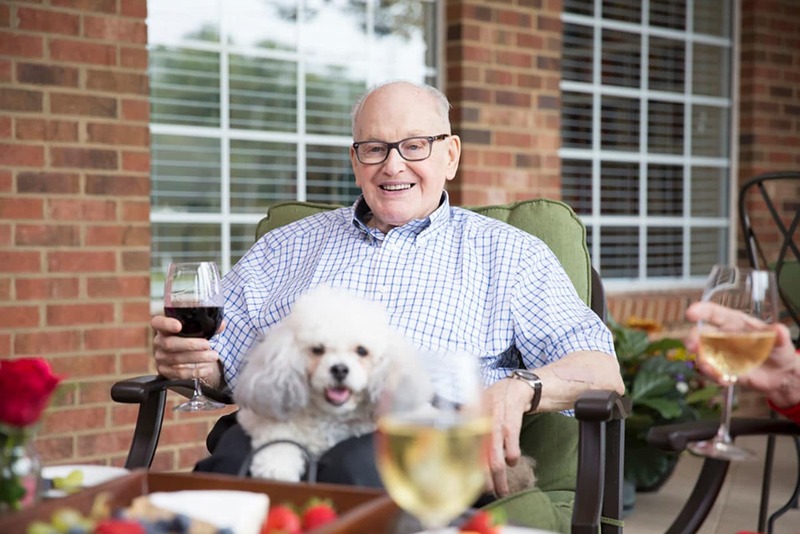 Did you know that Abbotswood at Stonehenge has been providing care to seniors in the Raleigh area for over 30 years? We have a reputation for being a friendly, family-like setting providing Independent and Assisted Living services. Abbotswood at Stonehenge has been awarded the top 10% in the nation for resident satisfaction scores through the NRC Health database – the largest source of long-term care and senior-living satisfaction metrics in the nation. And this isn’t something new to Abbotswood; we have been receiving high marks for years! So come join us for the open house, and while you’re here, enter our raffle for a chance to win great door prizes. To RSVP, please call 919.651.4882 to reserve your dinner plate and visit today to learn more about what makes Abbotswood at Stonehenge an award-winning community. The Caregiver Support Group for Adult Children of Aging Parents offers support through storytelling and listening that may open ideas for how to cope with the unique stress that caring for an aging parent or loved one can bring. The meetings are held in the Arts and Crafts room at Abbotswood. We are a group of family members who are caring for, or are concerned about, an elder loved one who may live away from us, who lives with us, who may live alone or may live in a residential care home setting. No matter how it looks, we are experiencing a lot of emotions of concern but also confusion and frustration, too. We don't have all the answers, but this group is a great and safe place to share your joys and concerns and perhaps share or hear some experience or insight that might be helpful to others. For meeting times, questions about the support group and/or to RSVP, please email Billy Dibbert at billydibbert@gmail.com and Tracy Taylor at tracy.taylor@kiscosl.com or call 919.651.4882. Seats are limited so please reserve your spot.